The political situation is rather stable. King Mohammed VI holds most political power in his hands. There is no immediate threat to the monarchy and establishment as the King is popular with the people. He continues to cautiously liberalise the political system and reform the economy. Maintaining political stability is highly dependent on reducing the high levels of poverty and youth unemployment in Morocco, otherwise an increase in social tensions cannot be ruled out. Dissatisfaction with corruption and economic inequality recently led to protests in the Northern Rif region. Morocco remains vulnerable to the threat from Islamic extremism. Especially Moroccan fighters returning from Libya and Syria are a concern for the authorities. Preserving security to avoid a negative impact on tourism is very high on the government´s agenda. 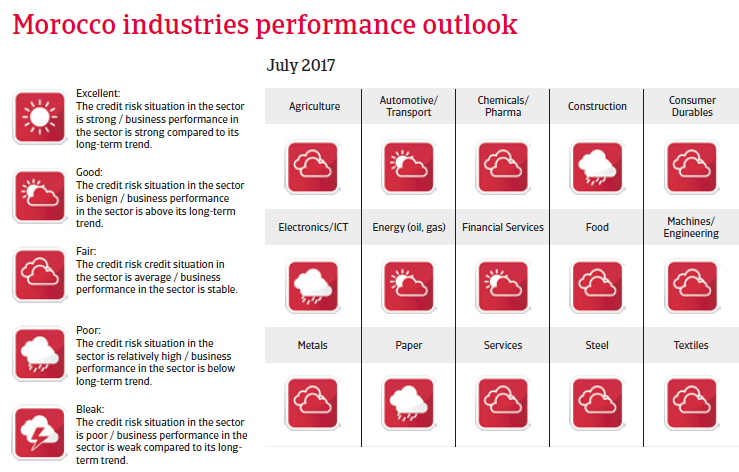 In 2017 economic growth is expected to accelerate to 4% after a modest 1.4% increase in 2016, which was mainly due to a drought affecting the agriculture sector. The country is still highly dependent on agriculture, which employs some 40% of the workforce, and swings in agricultural output have a major impact on private consumption and the economy. Other major areas of employment are tourism and commerce, while automotive exports generate the bulk of foreign exchange income, followed by remittances from Moroccans working in Europe. Morocco has made structural reforms to diversify its economy by developing industrial manufacturing, especially export-driven sectors (cars, aeronautics and electronics), and to provide a favourable investment environment. 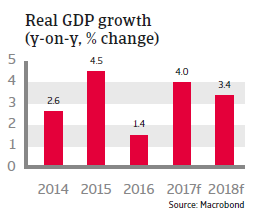 Low labour unit costs and a slightly undervalued currency enhance Morocco’s competitiveness. However, low levels of education, infrastructure shortcomings, nepotism, corruption and labour market inefficiency remain stumbling blocks, while competition from Asia limits future earnings capacity in the manufacturing sector. That said, in the medium-term electricity production will pick up due to large investments in renewable energy resources, while around 2020 Morocco will most likely start with large-scale gas production - both enhancing Morocco’s growth potential. 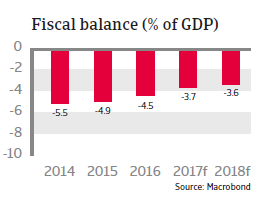 Due to the on-going consolidation the fiscal deficit is expected to decrease to 3.7% of GDP in 2017, and to continue declining further in the medium-term. That said, on-going subsidies and infrastructure investment keep expenditures high. Public debt is expected to stabilise at about 77% of GDP, which is high compared to other emerging markets. 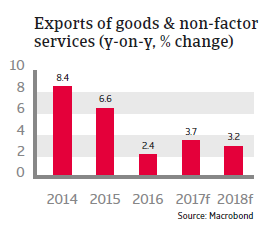 In 2017 and 2018 Morocco´s external financing requirement is expected to rise in line with its current account deficit, which is expected to increase due to higher costs for imports (commodities and capital goods). The deficit will be financed by domestic and external borrowing, with a steady inflow of foreign direct investment, remittances and tourist receipts ensuring liquidity. 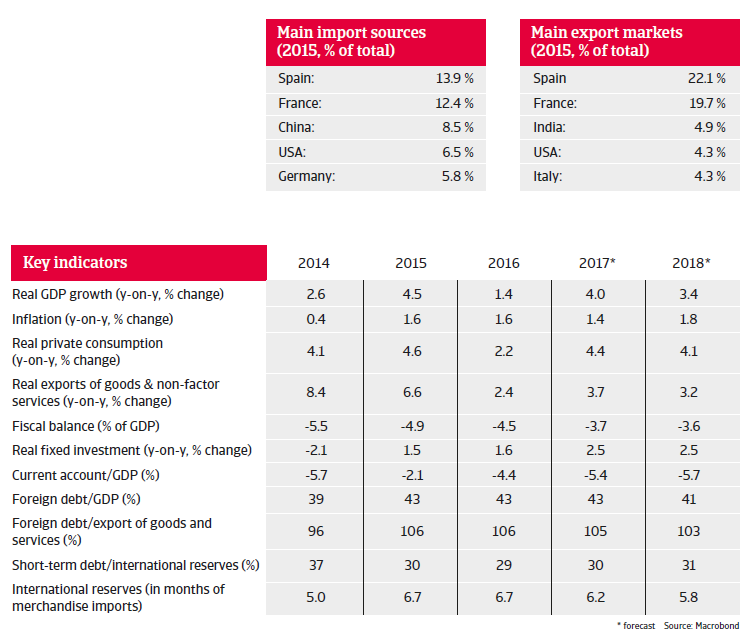 Morocco’s solvency position is acceptable (foreign debt amounting to 43% of GDP) while the liquidity position is good (more than six months of import cover in 2017). Additionally, Morocco has access to a precautionary liquidity line (PLL) with the IMF, which underlines creditworthiness.